At an international conference in Turkey this week, researchers from Wittenborg University highlighted the challenges in convincing SME’s to invest in sustainable energy solutions. “When speaking to SME’s and intermediate organizations, they indicate that investing in sustainability is not a priority. This may have to do with the fact that the relative advantage is not self-evident,” said Dr Saskia Harkema, one of the researchers who led small-scale research in the Netherlands and Belgium earlier this year to identify the barriers and obstacles preventing SME’s from participating in renewable energy projects. Another reason for the hesitancy might be that SME's are uncertain of the outcome in adopting sustainable energy solutions hence many wait to see how other companies are dealing with the matter. 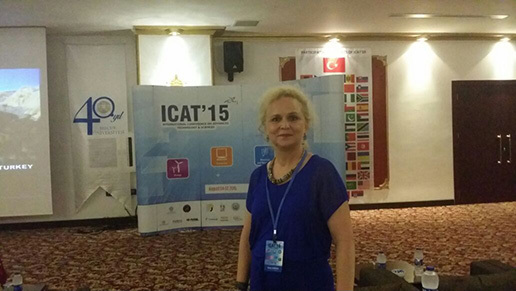 “It seems that decision-making could be influenced positively if SME’s are approached as a group of companies, rather than on an individual basis,” reads a paper Harkema presented this week at the International Conference on Advanced Technology & Sciences (ICAT ‘15) organized by ATScience Academic Publishing Group, Selcuk University and Gazi University together with other collaborating universities in Antalya, Turkey. The paper entitled "Challenges in the diffusion and adoption of sustainable energy solutions among SME's” also describes the preliminary outcomes of a cross-border EU-funded project called GREAT (Growing Renewable Energy Applications and Technology) which aims to encourage SME’s and collectives of SME’s to develop and apply sustainable renewable energy solutions. Wittenborg University, which is one of the Dutch partners in the project, developed an economic tool to increase the likelihood of investment in renewable energy by SME’s. The tool was also showcased in Turkey. “While trends show that thousands of cities and towns worldwide have policies, plans and targets to advance renewable energy, these often outpace the ambitions of national legislation, according to the Global Status Report Renewable Trends (2014). However, it is obvious that the success of all the initiatives taken largely depends on market acceptance and adoption,” the paper concludes. As part of developing an economic tool that would define the return on investment (ROI) for companies, Wittenborg has set up an excel sheet which includes an accompanying cash flow statement. The excel sheets have been developed per type of renewable energy (wind, solar and geothermal energy) and contain technical factors, investment costs, operational as well as maintenance costs and energy generation items. A different set of spreadsheets had to be developed per country due to different tax systems and other regulations. The inclusion of a smart meter for SME’s – which monitors electricity usage – is also an option in the economic tool. “The supply of energy is a fundamental element in the economic growth of societies. The way this energy is produced, supplied and consumed is a critical issue to ensure the current generation does not prevent future generations from prospering,” the paper warns.